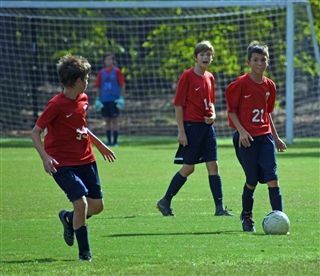 O'Neal Middle School Boys Soccer capped their undefeated regular season with a tournament championship last Friday, defeating Fayetteville Christian 4-1. After playing the Knights to a penalty kick shootout two weeks ago, the Falcons were well prepared for a challenging contest. Using the mantra "win the first five minutes," O'Neal instantly put Fayetteville Christian on the defensive with a game plan focused on dominating the midfield. 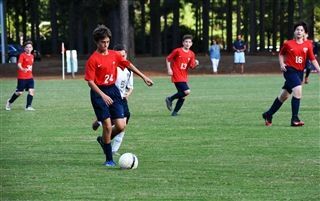 Ten minutes into the game this strategy paid off as O'Neal was able to keep the ball on Fayetteville Christian's end consistently and won a penalty kick when Boyd Kenny ‘24 was fouled in the box. Phillip Hancock ‘23 coolly placed the penalty in the bottom corner giving O'Neal a 1-0 lead. The same script played out again a few minutes later and Phillip connected on his second penalty kick goal of the half to double the lead. 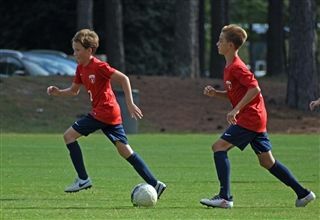 Shortly before the half, Reeves Cates ‘23 gave O'Neal a 3-0 lead with a fantastic free-kick strike from 25 yards out. In the second half, Boyd Kenny shut the door on Fayetteville Christian with a break -goal. The Knights did score late in the game to bring it to a 4-1 score, but the Falcons maintained their high pressure and shut down any further opportunities. It was a fantastic end to a great season! They completed an unbeaten season, finishing as SEMSAC Conference Champions with a record of 13 wins and 0 losses. Their success was balanced well between attack and defense and highlighted with a dominant playoff run, outscoring their opponents 11 goals to 3.